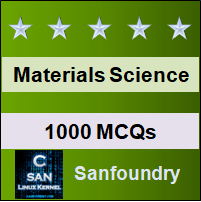 This set of Materials Science Multiple Choice Questions & Answers (MCQs) focuses on “Amorphous Solids”. 1. Which of the following properties is generally exhibited by amorphous solids? Explanation: Due to random organization of particles, amorphous solids have the same physical properties along all directions, or are isotropic. Random organization of particles also results in unequal bond strengths. Upon cooling, amorphous solids turn into a brittle glass-like state from a flexible rubber-like state. This is called glass-transition. Explanation: Metal glass or amorphous metal was reportedly first produced by W. Klement (Jr.), Willens and Duwez in 1960 at Caltech. It was prepared by rapid cooling (~ 1 MK/s) of molten metal alloys. 3. Polycrystalline solids are isotropic. Explanation: Anisotropy is a characteristic behavior shown by ideal crystals. However, the presence of flaws like grain boundaries causes the solid to deviate from crystalline properties. Explanation: Amorphous metals are not transparent and have relatively lower electrical conductivity. However, most metal glasses possess high magnetic susceptibility and low coercivity. 5. Consider the following cooling diagram for an amorphous solid. Explanation: An exact melting point does not exist for amorphous solids. 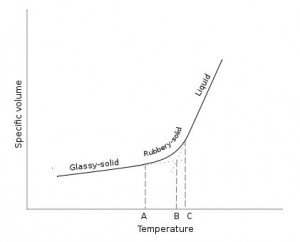 An approximate glass-transition temperature is defined by extrapolating the cooling curve as shown. Explanation: Glass inherits its transparency from crystalline SiO2, also called quartz. However, quartz has very high and narrow glass-transition. To overcome this, small amount of Na2 is added. CaO is also added to prevent water-solubility imparted by soda. Explanation: Well, crystal glass is amorphous, not crystalline. This glass earns its name from its excellent decorative properties and high refractive index. 8. Crystallinity increases with increasing rate of cooling of a liquid. Explanation: When a liquid is cooled rapidly, the particles get less time to move and arrange themselves in an orderly fashion and hence the crystallinity of the resulting solid decreases.